I don’t like processed cheese so I couldn’t finish the sandwich. I left the middle, which was thick with cheesy goop. And I didn’t feel like pretzels so I didn’t eat them. I put them aside for a snack, but they just sat there all day. I ate the nectar-apple though. 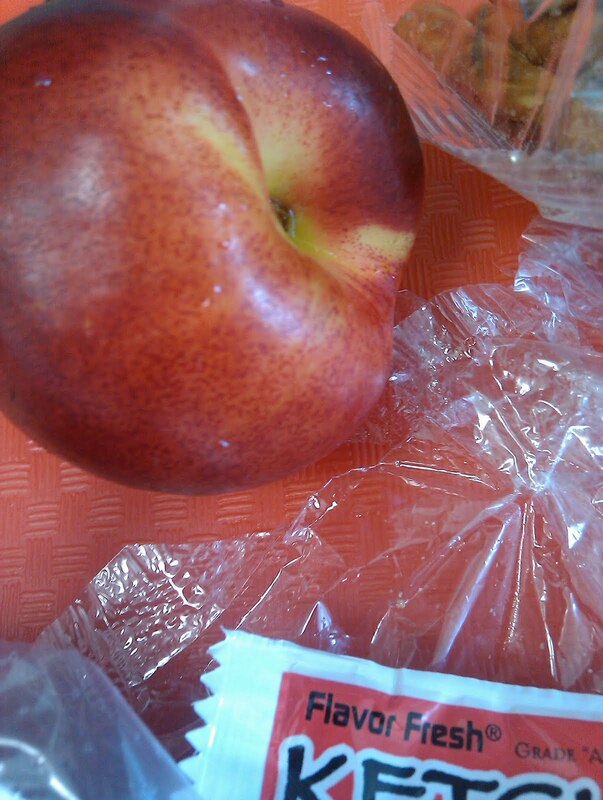 Part of why I thought this was a peach (when I had it last week) was that it is so crunchy. I’ve been lucky in life because I have always eaten nectarines that disintegrated into juice and pulp upon first bite. Nectarines were so messy that my mom would avoid buying them. But the sweet juice trickling down my neck and stickying up my hands was a simple pleasure. This piece of fruit was more like a crunchy apple: my first bite snapped off (I ate the whole nectar-apple). By 3pm I was absolutely ready to eat my own arm off. But today I did not have a headache even though I didn’t drink my usual vast quantity of water. Makes me wonder what is causing my headaches. So I’ll leave the celebrating for Friday when I’m done….if I make it there… What would you do this weekend if you were me? A devoted twitter follower @stepshep notified me about a story on NPR about high lead levels in fruit cups and fruit juices. Here’s the pdf with the listing of products (brands your family most likely consumes). Lead poisoning in children, Toxicity, Lead and Lead-info.com Crib notes: permanent, irreversible learning deficits. AHA! That explains a lot…. like my headaches? I am certain that the tests will not be covered by insurance, especially considering I just had the same tests run six months ago. I know I’m going to have to pay out-of-pocket for them and that is fine. I hope that the tests prove to be “unnecessary” but I think I need to know. Furthermore, I think everyone should get bloodwork done every year because we need to prevent illness. The American health system is overly focused on “saving” people from terrible diseases not preventing them through common sense. Thanks to everyone who alerted me to the A1C test. I have never heard of it, but I will bring it up to my doctor. I’m wondering if I have become more insulin resistant. And I’m now thinking I need to have my lead levels checked as well. I was honored to be invited to join the BlogHer network. What that means is that I can choose what type of ad appears on the blog (no pizza or other topics that are not in step with my goals). While I figure out if I like BlogHer, I’m going to keep Google Adsense too. The reason I do ads is to recoup the cost of the lunches and any out of pocket health expenditures. I’m also hoping to raise enough to fund a salad bar at my school when I complete the project. My son (age 4) was just diagnosed with Type 1 diabetes last week after a standard urine test at his well child check up showed high glucose levels. He is completely asymptomatic (for now) except for high blood sugar levels. (His A1C was only 6.5, and 6 is the upper level of normal). Standard check-ups are important. And that cheese sandwich looks so disgusting. I'd eat the tater tots, though! I completely agree with you on the healthcare point! While I do believe that there are a lot of unnecessary tests run I do not believe that routine blood work is one. You have drastically changed your eating habits so it just makes sense that you should get checked now instead of waiting till the end of the year. The problem with our healthcare system is not standard check-ups but the vast amount of under-insured people who have to go to the emergency room for basic care. Sorry for the tangent keep up the great work you are almost done!! If a peach or nectarine is crunchy it is not ripe. Our school served pears a few times– unripe crunchy pears. The kids didn't know what they were, and hated them. Kind of odd about your talk about nectarines/peaches. Around here, it's usually hard nectarines and soft, juicy, peaches. As far as I can remember, I've always had to set nectarines out for a bit to let them "ripen" before actually being able to eat them. Who the heck decided on using the word ripe? If you say ripe enough times it starts to sound funny. Probably could have chosen a better word. Have to go look up the etymology up on that one. Probably the Romans. They created everything bad that ever happened. Except Hitler. I don't think the Romans directly caused Hitler. But didn't he want to get into art school? Art=Roman. So maybe they are responsible for Hitler. Thinking about what I would do this weekend, if I were you, after eating all of those school lunches…a nice natural cleanse. No sugar, dairy, minimal meat, and LOTS of fresh fruits and veggies. 🙂 I am a teacher in a public school and I see the lunches everyday…eat a couple over the year when I've been in a bind. Thanks for opening up our eyes and the discussion. I enjoy checking in on your blog every couple of days. Mrs. Q: Congratulations on the end of your year, and thank you for this blog. 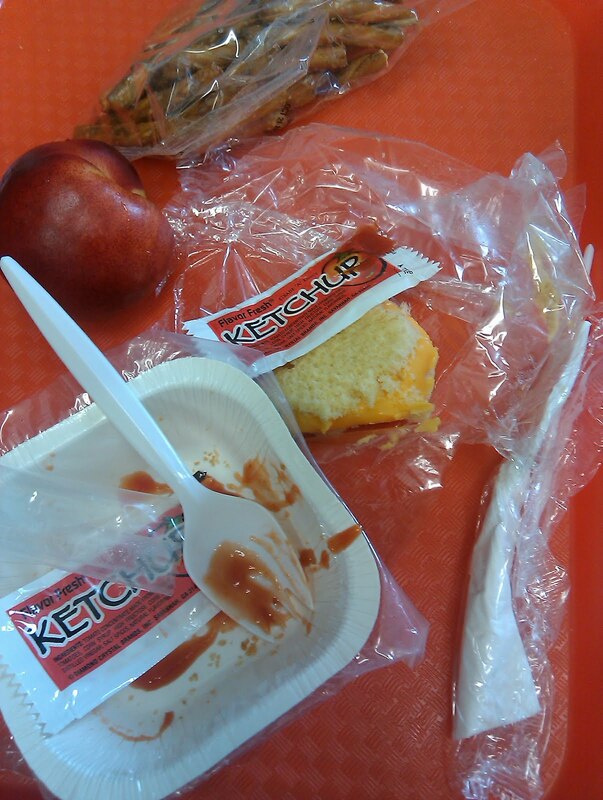 I am a teacher and a parent of adult children and I am increasingly concerned with food in our schools. I work in a public school with a great reputation for academics. We are told that our food service director is greatly admired! The food is horrible, much as you have documented. Spaghetti with french fries. Greasy, cheese pizza. Hot dogs with tater tots. Fruit flavored milk. Donut holes for breakfast. We don't sell soda, but kids drink soda from their lockers and hide large bags of cheetos and chips in their backpacks. What to do? I am considering some kind of action. Your blog has been wonderful. Have a great summer. Enjoy fresh food and your family. How could anyone in all concience feed that stuff to anyone let alone a child. Its the best advert ive seen for packed lunches. The lead content in those juice cups is not enough to poison an adult. Children under the age of 3 are the most susceptible because of their size. It only takes a dusting of lead to poison a child, but it takes a lot more to poison an adult. Most adult poisonings are a result of occupational poisoning (i.e. working in a factory that produces lead-based products or in a lead mine). You can request one from your doctor if you wish, but it is more than likely unnecessary. That lunch looks awful. Tater tots pretzels and cheese sandwich. The only good thing was the unripe fruit. Not a veg in sight. 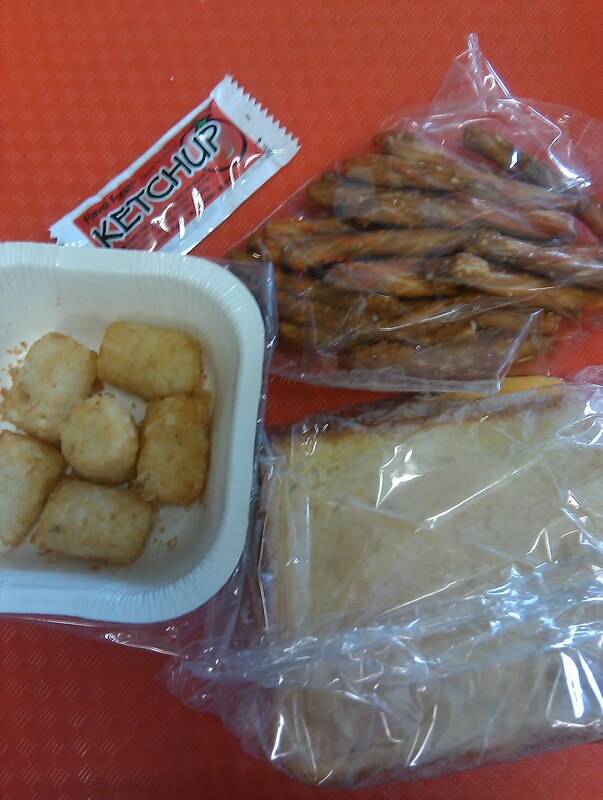 I think what really bothers me is that the food is so colorless. They should be serving a rainbow of colors and I don't mean dayglo. Mrs. Q, I would do exactly what you have been saying you would this summer. Relax, volunteer at your convenience, vacation, eat well and last but most important… Enjoy your husband and that sweet little munchkin! You deserve a break. I saw an interesting news piece on CNN a couple of weeks ago too. Remember all the fuss about BPAs in plastic water bottles? Now all water bottles and plastic wear say "BPA Free." New research indicates that there may be an unsafe BPA level in canned foods, too. The coating inside canned foods contains BPAs that may be seeping into the foods as well. Scary. Another reason to stick with fresh fruits and vegetables. On the healthcare tangent, I have to agree with the other commenter. Rising healthcare costs are caused, primarily, by uninsured people who need to visit the ER (the most expensive healthcare possible) for the smallest illness or injury. Additionally, a focus on preventative healthcare could save TONS of money. 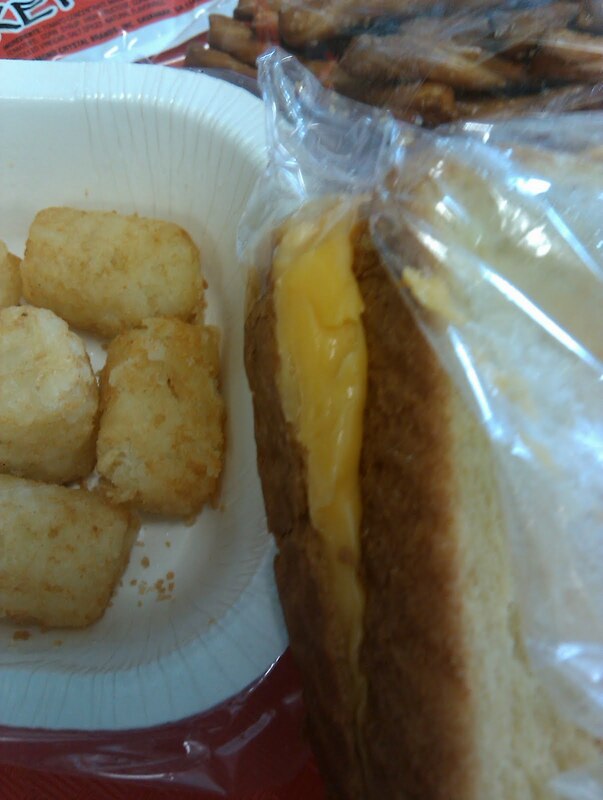 Cheese sandwiches were absolutely the bottom of the barrel when I was in elementary school. As in, it wasn't even served to the students as a whole–it was what they gave you when you forgot your lunch and would have gone hungry for the day. They had a section of the fridge full of semi-thawed cheese sandwiches (one slice of processed cheese sandwiched between one slice of wheat and one slice of white bread. Dry does not begin to describe it) and if you came up to the counter crying because you forgot your lunch, that's what they handed you. And you never forgot your lunch again. Could they cram any more carbs onto that tray?!? That's just setting the kids up for a mid-afternoon crash. Could they stuff any more carbs into that meal? Wow a piece of unripened fruit. Let me think, another carb! All processed carbs and one natural carb. Fake protein (processed cheese). Yuck. Not even real whole grain bread, real cheese, or fresh tomatoes on the sandwich. A side or fresh veggies would have been good. This meal is not even close to being healthy at all. I feel so bad for the kids (and you). It is no surprise that there is so much illness and obesity in this country. Has anyone ever wondered whether all this plastic packaging is leeching into the food when they heat it? I think it is the end of the year and they are cleaning out the fridge. Lets see what the last day of school brings. I've been worrying about the plastic and leaching bpa for a bit myself. What is the most sad is to do a medical test, the lab barely needs more than a few droplets of blood – yet when one goes to get bloodwork a full tube (and sometimes more) is taken. All this extra blood must be going to do additional and very unnecessary testing or simply being trashed where it has to be disposed of as medical trash. I just had a blood test recently and I paid over $200 even though I have insurance. I believe that's full price for the type of blood test I had done. As a healthy (at least according to my test results) 27 year old I'd love to know what insurance plan your anonymous commenter is talking about. Perhaps something associated with Welfare recipients? Or something that costs a fortune every month? It's certainly not my craptastic plan. I just had my first blood test ever in April. I'm 25. I eat healthy, exercise and my BMI is between 18-19. My husband and I are trying to have children soon so I made an appt. for a check up. I asked the Dr. about the constant bruising I've been having all over my body for the past 6 years. Turns out – my cholesterol is high (220), I have a stomach infection (h. pylori), I had mono AND my blood platelets are extremely low (hence the bruises). So low that if I had cut myself (or gave birth) I will lose too much blood too fast. I've been going to the Cancer Center ever since then for more tests, blood draws and consultations. Sure glad I didn't see getting a blood test as something that was "unnecessary". Graze, unnecessary testing is testing for which there is no indication- such as in a healthy 30 year old. In your case, there was an absolute indication. Graze – When I said unnecessary testing I meant testing for random things with no good cause. You had symptoms and concerns so there was a great need to see what was wrong. Now randomly checking things without a good cause is very wasteful and it's why we all have to pay so much for insurance and health care. I actually didn't have any concerns about my health when I went in for my test. It truly was a random test, just for my own curiosity. The bruising was just something I thought was a part of me. The stomach infection was from a food poisoning incident 2 years prior and the mono and thrombocytopenia (low platelets) were asymptomatic. I'm just thankful that I found these when I did. I always assumed that I was the healthiest person in my social circle. I was wrong. I agree that getting blood tests done each month just to "be sure" is unnecessary but unfortunately, that's what I have to do now for the next few years until my bone marrow starts producing more platelets.